Welcome to our Manchester travel section. 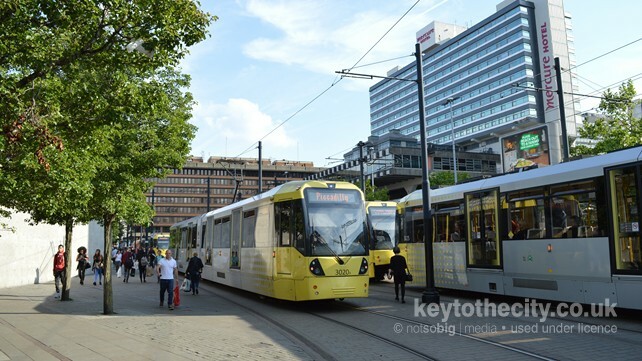 Here you'll find information on Manchester Airport, railway routes, coach links, the Manchester Metrolink tram system and local bus services. Manchester has an integrated transport system which means local trains, trams and buses operate together. You can buy a travel card to use across all types of transport in the city and beyond. See below for some ticket options. There is a good bus service in Manchester during the night with several routes operating 24 hours including the service to Manchester Airport. Manchester has its own airport located south of the city. It can be reached from Manchester Piccadilly railway station by fast train or by using the slower Metrolink tram system. Manchester is a hub for railways in the north west. Direct services operate from here to most parts of the country including London Euston, Birmingham, Liverpool, Leeds, Plymouth, Bristol, Cardiff, Nottingham and Scotland. The Manchester Metrolink opened in 1992 and is one of the largest networks in the country. An electrically powered tram system, it was built on the old railway line between Manchester Victoria railway station and Bury Interchange. Manchester is well connected by Road Transport. There are two coach operators competing for business which have greatly reduced fares between Manchester and London. Local bus users have a choice between Stagecoach and First Group who operate a near monopoly in the city. Canals in Manchester stretch right across the city centre linking west to east. Manchester's canals were the life-blood of the Victorian industrial era and the many old warehouses have been converted into hotels and apartments. Driving through Manchester during the morning and evening rush hours is very difficult to say the least with new road closures every month! In this section we will feature information on main routes through the city and parking in Manchester.